There are only two weeks to go in the college football season, with some Big 12 teams wrapping up this week. Oklahoma State traveled to Waco on Saturday night to face off against the No. 7 Baylor Bears and not many people were expecting it to be pretty. Well, Baylor received the opening kick and on 2nd & 6 from the Bear 35, Bryce Petty connected with Jay Lee for the first score of the game. Two plays, 36 seconds in, the Bears had a 7-0 lead and it wasn’t looking good. The Bear lead would be 28-14 at the break. 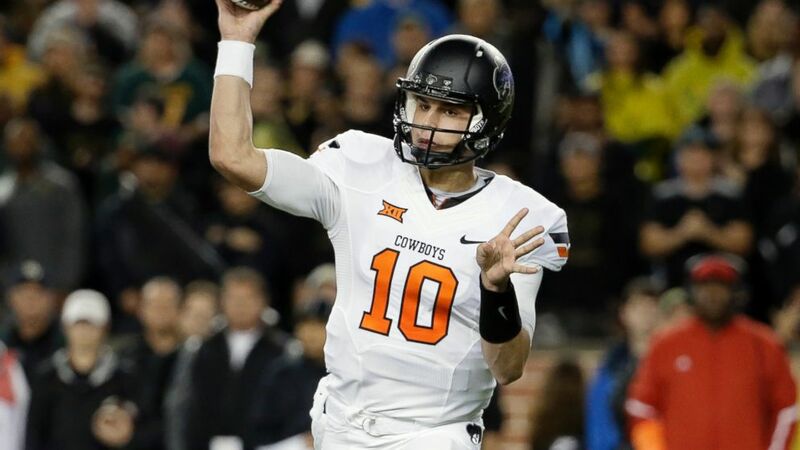 Mason Rudolph, who was supposed to receive a red shirt this year for the Cowboys, started after Daxx Garman (who has been starting for the injured JW Walsh since Game 3) exhibited concussion symptoms following OSU’s loss to Texas on Nov. 15. Rudolph’s performance was very solid, especially considering it was at No. 7 Baylor. Oklahoma State must beat Oklahoma on Dec. 6 to go bowling, whereas Baylor controls their own Big 12 Championship destiny. Kansas State played their second Thursday game of the season at West Virginia. The two teams combined for seven Special Teams scores – with four K-State Field Goals, a K-State punt return TD and two Mountaineer Field Goals. Jake Waters put up 400 yards through the air in addition to leading the Wildcats in rushing with 13 yards. K-State as a team net 1 rushing yard. Clint Trickett only passed for 112 yards with 2 INT’s. Skyler Howard replaced Trickett and passed for 198 yards in the Mountaineers’ loss at home to Kansas State. Oklahoma dominated from the start in a 44-7 win against Kansas in Norman. Iowa State scored 17 unanswered points going into halftime to take a 17-14 lead on Texas Tech, who would come back from down 10 to beat Iowa State. No. 5 TCU over Texas – The Longhorns have been playing much better as of late, however the TCU offense, led by Trevone Boykin who beat the Horns on Thanksgiving two years ago, is much higher-powered than any other offense that Texas has faced with the exception of Baylor. On the other side, if TCU can contain the Longhorn running attack of Malcolm Brown and Johnathan Gray, then Texas is going to struggle mightily against the Horned Frogs. Kickoff from Austin on Thanksgiving night is set for 6:30 on Fox Sports 1. West Virginia over Iowa State – Iowa State is likely to finish last in the Big 12 this year. The most interesting story line in this game to me is whether Clint Trickett returns from his concussion or if Skyler Howard will get the start in Ames for this 11 a.m. kick on Fox Sports 1. No. 7 Baylor over Texas Tech – The Red Raiders looked bad against a bad Iowa State team on Saturday. Now Texas Tech heads into their season finale with a 4-7 mark and has to play their rival at a neutral site. Look for Bryce Petty to explode for the Bears in Arlington on ABC/ESPN2 at 2:30. No. 12 Kansas State over Kansas – The Wildcats are a very good team this year, led by Senior QB Jake Waters. Kansas fired their head coach in September and since then, Clint Bowen has freightened some teams (Oklahoma State, TCU) and even beat Iowa State. However, all of those games were in Lawrence. This game is in Manhattan on Fox Sports 1 at 3 p.m.